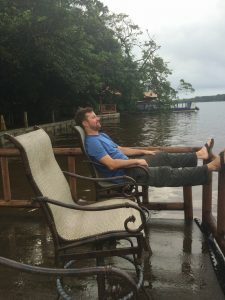 Don’t overthink it, a friend laughed when I mused about the purpose of our trip to Costa Rica. Just have fun. We did have fun, but now that we’re back I feel compelled to shift back into overthink. Papa survived the travel. 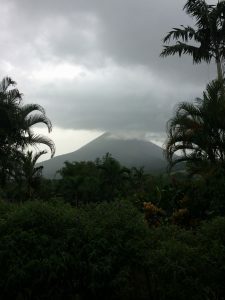 His best days were hanging back with our son and grandson enjoying the hot springs in the shadow of the Arenal Volcano. 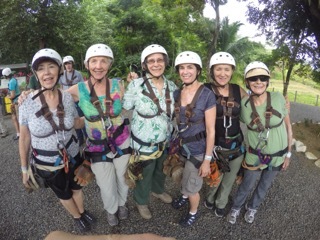 That and zip lining in Costa Rica high above the Los Suenos canopy. Son preferred the drier Pacific side to the hot, wet Caribbean side. Teacher that he is, he expressed particular enthusiasm for the presentation on the socio-political history of Costa Rica. Surfer that he is, he tried his darnedest to hitch a ride to a primo surfing spot but never made the connection. Still, he soaked in the experience. Grandson learned to run with herd. Not one to pop right out of bed, he adjusted to early departures quite well. His proudest moment was the morning he rewrote his story. No more the boy who fell from a second floor window onto a concrete patio, he summoned the courage to kick away from a platform into the air. Suspended by cables, he zipped off the first of 12 platforms to the cheers of the other children, and the tears of his grandparents. He completed the course and now he’s a boy who zip lined in Costa Rica. He has new stories to tell. We all loved the meandering boat ride in the canal discovering new wonders around each bend: a brightly colored Northern Jacana trying to desperately to distract a caiman lurking in the water from a fuzzy chick hiding in the tall grass; a two-toed sloth, high is a tree, stuffing leaves into his mouth; leaping Jesus Christ lizards, sunning iguanas, soaring great green macaws. 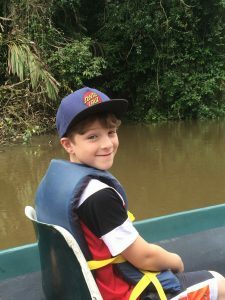 As fun as observing the antics of spider, howler, and capuchin monkeys, our hearts were equally warmed watching a special group of eight children ages 8 to 15 bond immediately and treat each other with affection and respect. 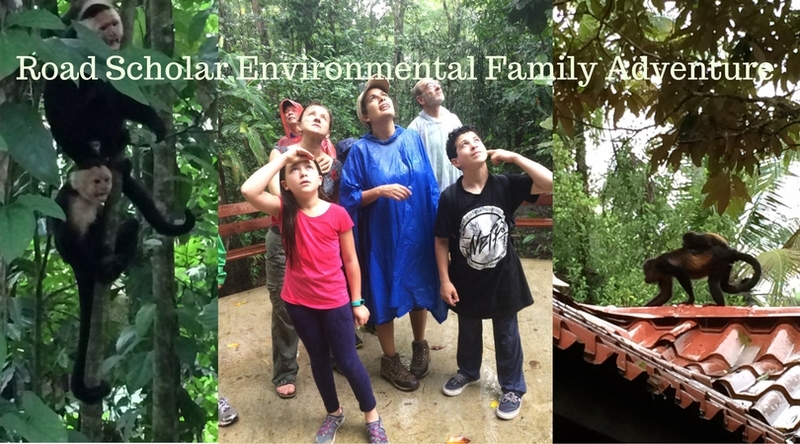 I highly recommend Road Scholar intergenerational tours. Sounds like a great trip. You are braver than I am. I don’t think I’d do the zip-lining, but I would like to see Costa Rica. You could do it if you didn’t overthink it! Perhaps, but I am prone to over thinking things!